For efficient condensate drainage of industrial process and HVAC equipment. Inverted bucket traps rely on the density difference between steam and water to drain condensate as it forms. An inverted bucket floats in condensate that surrounds the bucket. As the bucket moves up and down in the condensate, a linkage connected to the bucket closes or opens a discharge valve trapping the condensate or allowing it to escape. Maximum system efficiency results from steam space being kept free of condensate. The trap body must be manually primed at initial start-up. (Under low load or superheat conditions, the trap may also need to be primed.) Under operation, the trap body will remain full of condensate. An inverted bucket floats in the condensate that surrounds the bucket itself. As the bucket moves up and down in the condensate, a linkage connected to the bucket closes or opens a discharge valve located at the top of the trap, trapping the condensate or allowing it to escape. During start-up, air is vented through a bleed hole in the top of the bucket into the return line. When air or steam flows into the trap, it enters the underside of the bucket and collects in the top of the bucket. 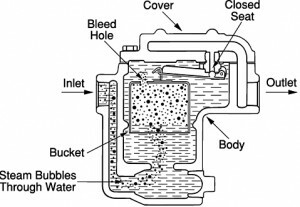 The contained air and steam cause the bucket to become buoyant and rise in the condensate causing the lever mechanism to close the discharge valve into its seat. The bucket loses its buoyancy as the enclosed steam condenses due to radiation losses and steam escaping through the bucket vent hole. When this happens, the weight of the bucket will cause it to fall and pull the valve off its seat, and the cycle repeats. An optional thermal vent installed in the bucket allows faster air venting during start-up. Completely drains condensate at saturation temperature. Open bucket design will tolerate moderate water hammer. Normal failure mode is open. Sediment and dirt are kept in suspension until discharged with condensate. Only two moving parts, lever assembly and bucket, leads to reliable operation. Marginal air handling during start-up. Cycles fully open or closed, which can create noise. May lose prime during light loads and blow live steam. Requires manual priming to provide water seal. Does not withstand freezing temperatures. Best for stable, steady load and pressure conditions. Process main drip traps for continuous operations. Where condensate is lifted or drains into wet return line. Heat exchangers without a modulating steam regulator. Stainless steel internal components withstand corrosion. Cast iron bodies for long, dependable life. Wide range of seat pressures available – up to 250 psig to fit a wide variety of applications. Removable covers for easy in-line service. Optional built-in strainer reduces number of piping connections. Optional built-in thermal vent for faster heating. (B1, B2, B3 and B4 models only).